This article demonstrates how to download and install Progress Telerik UI for JSP and run a sample application. \styles—The Kendo UI minified CSS files and background images used by the themes. \wrappers\jsp\kendo-taglib—The Progress Telerik UI for JSP jar files. \wrappers\jsp\spring-demos—A sample JSP Spring MVC application. 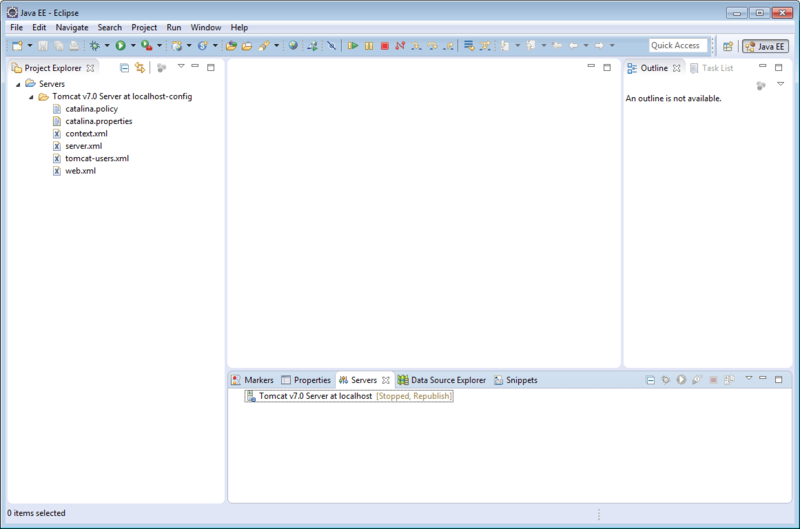 Find a sample a JSP Spring MVC application in the \wrappers\jsp\spring-demos folder. 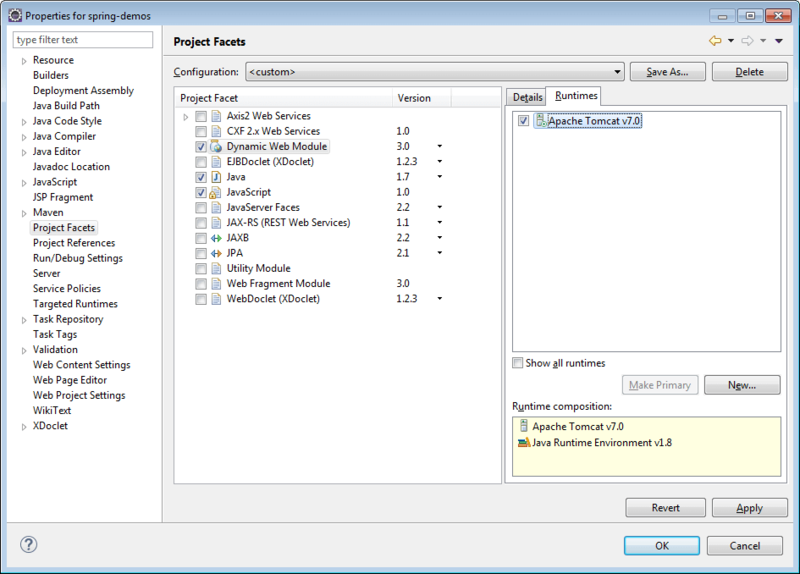 Step 1 Extract the Progress Telerik UI for JSP package. Step 3 Choose File > Import. 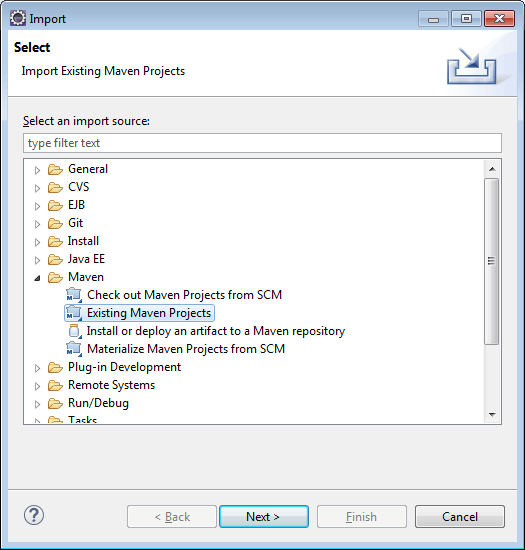 Step 4 Choose Maven > Existing Maven Projects. Click Next. If you do not see that option, make sure your Eclipse has Maven support installed. Step 5 Browse to the location where you extracted Progress Telerik UI for JSP. Then pick "wrappers\jsp\spring-demos" for "Root Directory". Click "Finish". Step 6 Right-click spring-demos in the Eclipse Project Explorer. Pick Properties. Step 7 In the properties window pick Project Facets. Step 8 From the "Project Facets" menu select "Dynamic Web Module". Step 9 Click the Runtimes tab. Pick a runtime—Tomcat7, for example. Step 10 Click OK to close the Properties window. 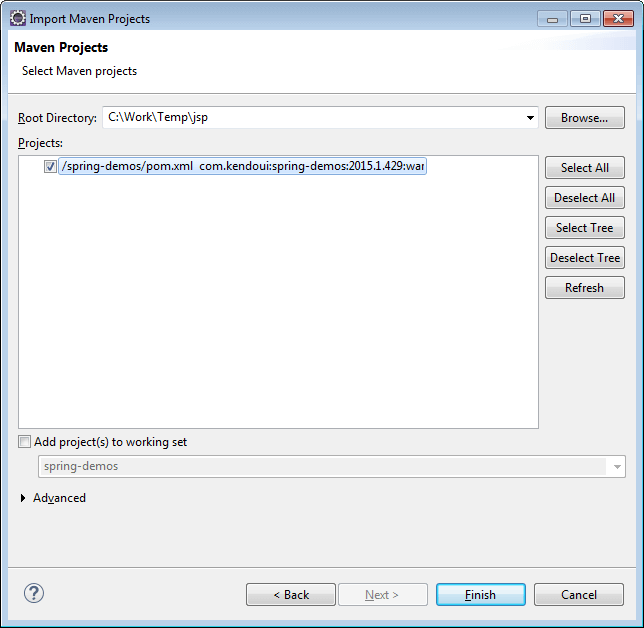 Step 11 Right-click spring-demos in the Eclipse Project Explorer. Pick Run As > Run on server. Follow the steps below to add Kendo UI to your JSP application. 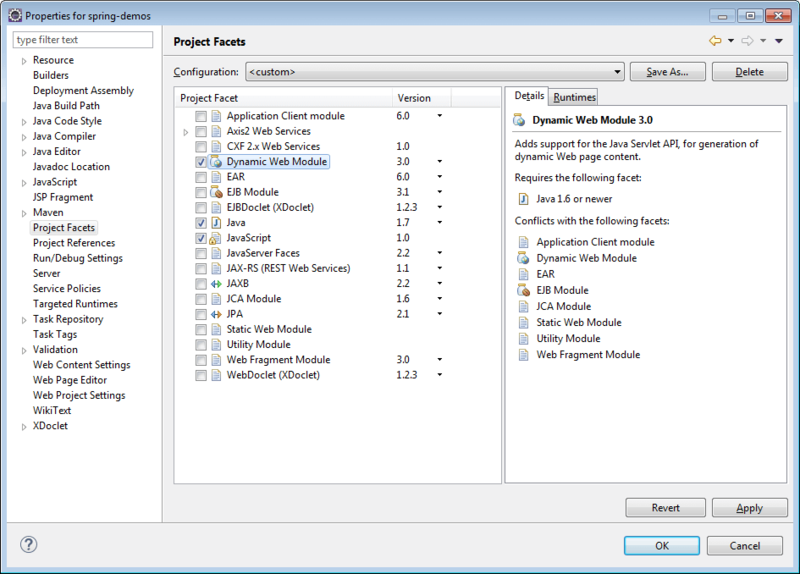 Step 1 Create a new Dynamic Web Project from Eclipse or open an existing one. Step 2 Add \wrappers\jsp\kendo-taglib\kendo-taglib-[version].jar to project's /WebContent/WEB-INF/lib folder. If you intend to use CDN services, skip steps 3, 4, and 5, and check the section on CDN below. Step 4 Copy the Kendo UI CSS files and folders from the \styles folder of the installation to the WebContent/resources/styles folder of your application. If you want to use only one theme, copy kendo.common.min.css, the theme file (e.g. kendo.default.min.css), the theme folder (e.g. Default) and the textures folder. Step 5 Add a JSP page. 1. Right-click the WebContent folder. 2. Select New > JSP file. 3. Enter a file name and click Finish. Step 7 Add taglib mapping to the Kendo UI tags. Step 8 Use any Kendo UI HtmlHelper extension. For more examples on how to use Kendo UI with JSP wrappers, visit the GitHub repository with the collected Kendo UI examples on using JSP.